The Mon Calamari people are humanoid, about 1.7 meters tall. They have salmon-colored skin, high-domed heads, webbed hands and large, goggle-like eyes. The females are more streamlined, with olive-colored markings on their salmon skin. The Mon Calamari hail from the watery world of the same name, which they share with the squid-headed species called the Quarren. While both species speak the same native tongue, the Mon Calamari have adopted Basic as their language. Mon Calamari and Quarren are very different in their outlook on life, as the Mon Calamari tend to be idealists and dreamers while the Quarren are pragmatic and realists. During the waning days of the Republic, Quarren politicians represented the the various communities of the water world in the Galactic Senate. The Mon Calamari are shore-dwellers, land beings with an affinity for water. The Mon Calamari developed slowly, building an advanced technology around them. They contacted the Quarren, and after some confusion, developed a symbiotic relationship. The Quarren would provide the raw materials and metals while the Mon Calamari refined them into useful items of technology. Foremost among these items was the Mon Calamari's formidable fleet of exploration vessels. The Mon Cals (as the Quarren call them) began leaving their world to explore the islands in the stars. When the Empire came to power, it began seizing property on the Mon Calamari homeworld, and the peaceful aquatic species countered with passive resistance. The Empire would stand no defiance, and used massive Star Destroyer weapons to destroy three floating Mon Calamari cities. The response was unexpected. The Mon Calamari took up tools as armaments, and what little weapons they had, and fought back. The Empire fled Mon Calamari, and after their short victory, the Mon Cals joined the Alliance to Restore the Republic. The Mon Calamari converted their beautiful exploration ships and space liners with weapon mounts and armor plating, turning them into the Mon Calamari star cruisers. The Mon Calamari had been fighting the Empire for years before they joined the Alliance. They were instrumental in creating a diversion while the core Rebel group abandoned their base on the fourth moon of Yavin. When they joined, not only did they bring their star cruisers, but the leadership of one of their finest council members, Ackbar. 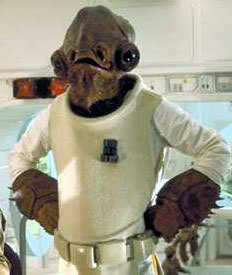 Admiral Ackbar is the most respected of the Alliance Mon Calamari and leader of the fleet. He is the stern gravelly-voiced tactician that led the fleet as it engaged the Empire at the critical Battle of Endor. The Mon Calamari are able to descend to depths of up to 30 meters below sea level without requiring breathing or pressure apparatus. Though they can breathe water, they find it somewhat uncomfortable, and use organic gills whenever possible. A panicked Mon Cal, particularly a young one, could still potentially drown underwater. They do not need to decompress when resurfacing. The Mon Cals can stay underwater for an indefinite length of time, although they cannot sleep underwater due to various physiological and psychological reasons. Calamari was the first place the reborn Palpatine took his World Devastators, and was later attacked by Admiral Daala, in an attempt to show her superiority. The Mon Cal, along with Quarren and the New Republic, have driven back all attempt to take the planet.